If you suffer from pain in your toes, then you already know just how uncomfortable this can be. Whether you suffer from pain in one toe in particular or several toes, you should know that you don’t have to live with toe pain. Think about your own toe pain? Is it constant or does it briefly come and go? Does your toe pain throb, tingle, or burn? Perhaps you have painful cramps in your toes. No matter what your specific toe problems are, there is a way to try stabilizing painful toes that cause you to hurt when you walk or apply pressure to your foot. Whether you suffer from bending toes, hammer toes, claw toes, or overlapping toes, one way to stabilize painful toes is to buy toe loops. A toe loop will provide both a source of cushion and relief for the problem area. They work by securing toes together, which can stabilize a fracture or even correct toe problems like hammer toes and bending toes. Toe loops should be somewhat flexible and even comfortable for you to wear. You can purchase them in two sizes: narrow or wide. The best part is that these loops can be cut or trimmed to provide a custom fit for your toes. Solutions to stabilizing painful toes do not cost much. A loop for the toe is relatively inexpensive and costs under $20. If you buy the ones that are washable, you can reuse them, which will help cut down on the cost of using them frequently. If you purchase washable loops, make sure you wash them frequently since they are on your body and may soak in any sweat or odors that are on the toes and feet. Toe Loops – This is a stretchable strap with a foam lining that wraps around the toes that need stabilization or protection. If you have toes (aka hammer toes) that rub up against the tops of your shoes, you can use this to prevent the abrasion and rubbing. There are some benefits to stabilizing painful toes. By stabilizing the pain, you should be able to walk comfortably instead of avoiding the act of putting pressure on your toes. Once you get the toe pain under control, you should be able to comfortably get your shoes on your feet and wear them for extended periods of time without additional pain. If your toe pain causes other symptoms in your feet or legs, these symptoms should diminish or disappear once the toe pain is gone. There are also some benefits in your home environment. Think about how much time you spend sitting down in your home just to avoid the pain that movement can cause to your toes and feet. You are missing out on life and the activities that you enjoy around your home. Instead of feeling left out, you can join in the family fun without worrying about the toe pain that you might experience. There are many situations in which you will find that stabilizing painful toes is useful. If you have a job that requires you to be on your feet for any amount of time, you will notice a difference in the way your feet and toes feel after a day at work. If you enjoy living an active lifestyle, ridding yourself of toe pain can help you get active again, so you can enjoy the activities and hobbies that lead to a happy life. You have probably already figured out that toe pain can lead to tired feet at the end of a long day. Suffering from tired feet can keep you from taking part in an active lifestyle. Instead of letting toe pain control what you do, take control of the situation and get your life back on a healthy, active track, so you can feel good about yourself and keep you body in excellent condition. As people age, their bones become more frail and balance slowly declines. Although you can be the most fit person in the community, old age takes its toll on overall health. If you, or a loved one, has a chronic disease or injury that requires wheelchair assistance, a belt alarm enhances the chair’s safety level. Among many of its purposes, belts stop potential falls to keep loved ones free from further injury. A wheelchair belt alarm is actually a simple circuit that can alert attendants if a person unbuckles the harness. An alarm unit attaches to the wheelchair’s backrest, out of reach for the chair user. The belt connects to the alarm unit as it wraps around the person. Once buckled, the circuit is complete, signalling the alarm to remain quiet. When the circuit is broken by unlatching the buckle, the alarm sounds. Wheelchair belts are not meant to be restraints, so the buckle is an easy-to-open mechanism. The user should still be able to unbuckle the belt in cases of accidents, such as a tipped over chair. A buckle that is difficult to unlatch could lead to severe injuries for the restrained person. Imagine this scenario. You are taking care of your father who is in a wheelchair. But he always wants to do things on his own. You step away to cook a meal. All it takes is a moment for an accident to occur. Your father tries to reach for an item and falls out of the wheelchair, injuring their head and becoming unconscious. Without this belt, you would still be cooking a meal unaware of the tragedy that just occurred. If you used a wheelchair belt alarm, your father would have been reminded to stay in their wheelchair and wait for assistance, while an alarm would have alerted you that your father is out of the wheelchair. A few extra minutes can save a life. Although these belts appear to have more use in a hospital or convalescent environment, they easily enhance the home experience. For example, patients with dementia or Alzheimer’s may not be mentally capable of understanding their peril if they move from their wheelchair. Alarm belts notify caregivers immediately if the person is trying to stand or walk away from their chair. Other patients, who are otherwise mentally-capable, may simply be stubborn about their wheelchair needs. Refusing to wait for a caregiver and standing on their own, patients increase their chances of falling and breaking a bone. In the elderly years, a broken hip could lead to more serious injuries. Keeping a loved one in the wheelchair until assistance arrives preserves their current health. Most alarm belts sell between $100 and $200. It may be possible to negotiate with your loved one’s health insurance to see if some of the cost can be offset with insurance funds. Especially for mental conditions, it is more cost-effective for health insurance to pay for an alarm belt than for medical costs associated with a fall from a wheelchair. Talk to your health insurance provider to see your options. 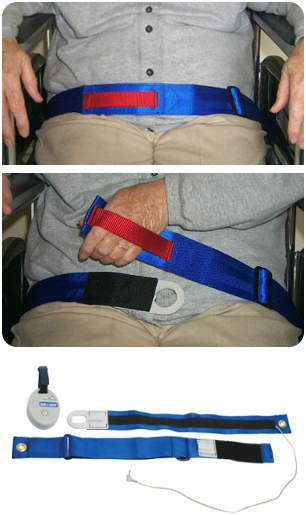 Recommended Wheelchair Belt Alarms– This belt alarm is made of strong nylon and has a velcro for easy belt removal. The alarm is a 95dB horn sound. Avoid buying a used or heavily discounted alarm belt. There may be mechanical or electronic issues with the belt. You do not want to compromise on quality when it comes to patient safety. In general, alarm belts use simple electronic circuits to generate a loud signal. Maintenance is key to keep the belt in working order, however. For many units, an LED, or light-emitting diode, illuminates on the alarm unit. This light indicates that the unit is working normally. If the light doesn’t illuminate, a new battery may be necessary. Check your manual to see if the unit has a test button. If a button exists, test the belt each day by pressing the button. It tests the alarm function and battery at the same time. If there is any hesitation, replace the battery promptly. Most units take one or two batteries, such as 9 volt or AA batteries. Keep your loved ones safe with a wheelchair alarm belt. Explain the belt’s purpose to the patient to help them understand its purpose. With good reasons, many patients welcome the alarm to keep them safe. Although some people may not be excited by the idea, the belt protects patients from exacerbating a condition or severely injuring themselves.